To experience this kind of connection through the milestones in people’s lives is simply amazing. Hi Kambra! What moments remind you of why you chose the floral business? I’d always enjoyed flowers and floristry, but it wasn’t until we moved to Prosper in 2009 that things changed. The town had a population something over 8,000 then. It was perfect for us. Sadly, we had a pet pass and my sister sent an arrangement. We were delighted and sent a picture back. It turned out to be a much, much lesser value than what she’d paid for. She’d had to go through an order gatherer to get something to us. Later, I decided to do some flowers for a friend’s fiftieth birthday and people really loved what I’d done. Word got around and I found myself getting lots of requests. I was making prom corsages at one point, then Valentine’s Day came and I was doing around fifty arrangements out of my garage! So those experiences came together to create Prosper Blooms. As our business bloomed, so did the population, which stands today at around 22,000! Once I did a couple’s prom and homecoming, then I did their wedding, and I just did their first “welcome baby” arrangement! To experience this kind of connection through the milestones in people’s lives is simply amazing. We started in a small metal building in an industrial area. 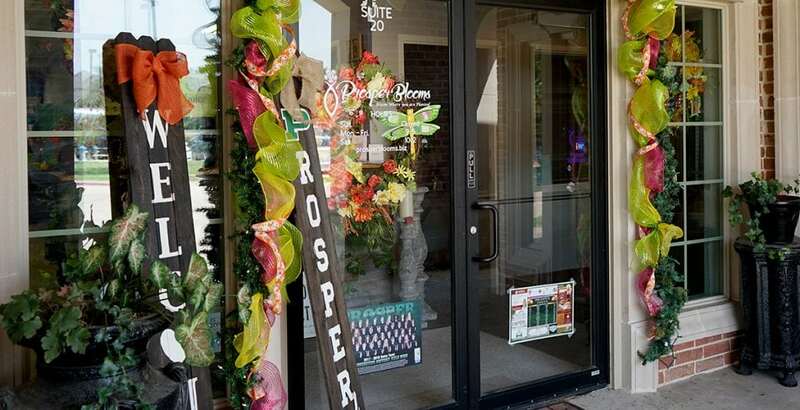 Prosper had a florist before it had a grocery store. But it was a blessing, a leap of faith I was willing to take as a Christian. At that time, we did a nine mile radius search and there was no other florist. Of course, there were those order gatherers! I shut them all down as fast as I could, then I received a call from Lovingly. With people like Lovingly, with resources like that, and support like that, we don’t need to rely on order gatherers. Other florists are coming around, too. I’m a member of a lot of Facebook groups and networking floral groups all over the nation. We’re really coming together and trying to shut the order gatherers out, while educating florists who think they need them. My husband is in the IT business, so we were looking at website building, which is expensive. And I was on Facebook, Twitter and Instagram, but it just seemed like it wasn’t enough. We decided that Lovingly was the best investment. We knew we could have Google Ads management done for us at no extra cost, and a great website that really competes and brings in business. We had the Lovingly Photoshoot recently and it was a great experience. We had a bunch of orders that day, so people came in and we’d make an arrangement and this professional photographer would take a picture. Then the next one would come in and so on. It was a fun experience. I love the shots they took of my staff and I. One featured the building and my location, which is great because people like to see that you’re a real flower shop. We’ve already had online orders where people select our custom bouquets, so it works, and it was free. I love the Florist’s Choice, too, because we’re able to get creative. Some staff do better with a recipe regiment and some do better with a free hand, and this caters to both styles for my designers. And it’s like Christmas when you come in and there are orders sitting on the printer. We hear the paper being sucked into the printer and we all go, “Yay!” We know our Lovingly website is bringing in more business when we hear that! Within two or three days of the Lovingly Weddings launch, I had three or four inquiries come in. I don’t do too many weddings, so I’m considering expanding that side of my business now. I like it because couples find you and it’s so much better than registering with other providers. This is great and it’s all part of the partnership. I also think that the new Lovingly U offering is ideal, because I won’t need to look elsewhere for my webinars and other things. My designers are hungry for the types of design information and trends Lovingly U is bringing. They’re inventive and creative, so I want all that incorporated into my staff meetings. Like the weddings service, my business is getting so much without additional charges. I’m very excited about Lovingly U.
It’s crucial to compete online today. What florists should know about Lovingly is that they’re a real partner. They don’t make money unless you make money, and they offer really a lot of things as part of your partnership. They’re not out to get something, or hit you with hidden costs. There’s nothing shady about Lovingly. They’re trustworthy. So if you want your business sales to increase, Lovingly is the way to go. There’s a lot of competition out there. The wire service people still visit and try to woo us. One guy brought us donuts! Still, I say to them, “This is what I have with Lovingly. What can you do?” And it sends them away. The wire services have all those fees. You have to be careful. Don’t let fear stand in your way. Try something new. A florist called me only last week and said she was considering Lovingly. I ended up talking to her for about twenty minutes. And I didn’t hide my figures! I’ll shout about what Lovingly has done for my business. I told her how Lovingly is trustworthy, how it meets all my needs. I’m pretty sure she’s all signed up with Lovingly now, and I’m excited for her! I was born in Oklahoma City. My family moved us to New Mexico where I attended high school, but finished college in Texas. 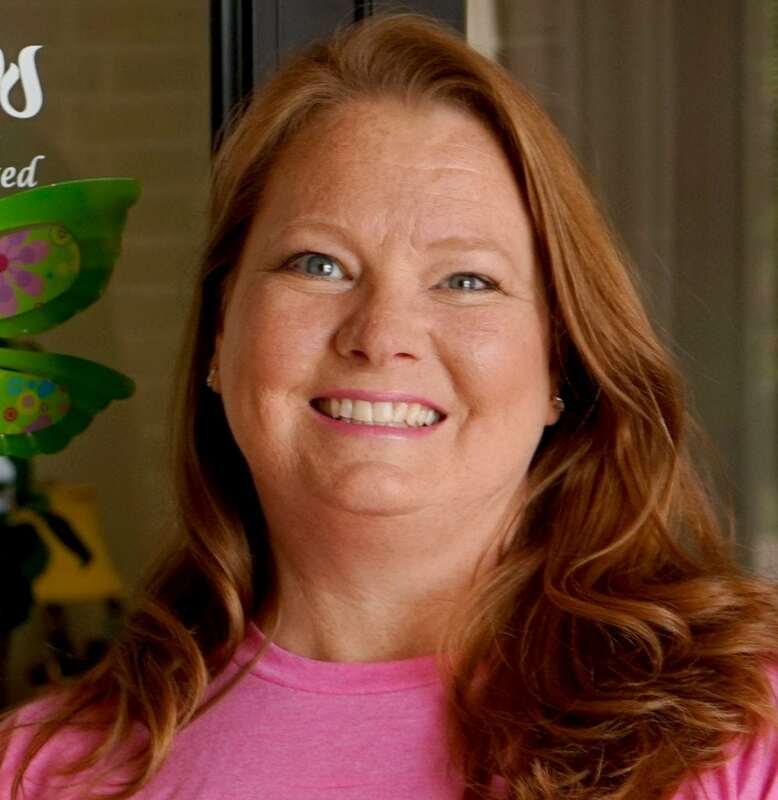 From moving my family to a town of 8,000 and working out of my garage to opening a successful shop in a town of now close to 22,000, my floristry has exponentially grown, and with Lovingly, so has my business!